Type in the phrase “Vilnius Nightlife” into Google and you’ll get approximately 230,000 results. Type in “Vilnius Jewish Sights” and the results will be almost 200,000 less. After about four days of living in Lithuania’s capital, this difference in representation of Jewish history seems about right. 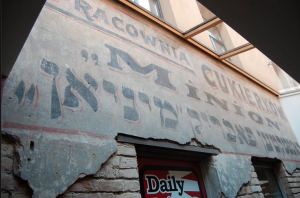 The preservation and acknowledgment of the once bustling Jewish presence does not seem to be a Lithuanian priority; shop signs in Yiddish are indiscernible compared to the freshly painted Lithuanian ads while the monuments that are present seem to have been thrown into the city planning as an after thought. For instance, the plaque to the now destroyed original Jewish synagogue is a relatively small easy to miss piece of commemoration. If it weren’t for our elderly Jewish tour guide we would have walked right past it. 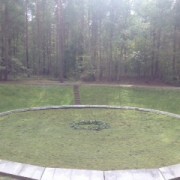 The same goes for the site of the former Vilnius Ghetto library. 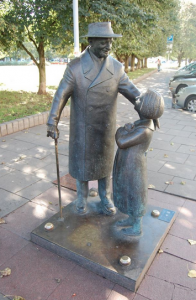 Similarly, in a shadowed park corner, tucked away from the main streets stands a statue of a very well known Jewish doctor Tsemach Shabad. 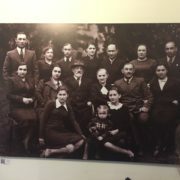 During his life and time in the Vilna ghetto, Tsemach Shabad served as a prominent leader for the Vilnius Jewish People’s Party. Additionally he was known as a beloved doctor, attending to the inhabitants of the ghetto. The facts stating his Jewish heritage were conveniently left off the small rusted metal plaque left in his dedication. Perhaps at first glance it may seem as a minor detail in his great scheme of work, but through the lens of remembrance, this small detail can be perceived as an act of forgetting and by some as a micro act of anti-Semitism. Conscious or not, the city of Vilnius has taken part in the repression of Jewish memory. For instance, before even arriving to Vilnius we were given an official, city sponsored travel brochure describing the top destinations Vilnius has to offer. Among the list were places such as Cathedral Square, botanical gardens, and water parks. Of course we had never been to Vilnius so this brochure seemed to be typical of all the other travel media we had seen. However, after four days, four tours, and four museums, we now understand the problem this brochure raises: It almost completely over shadows major sites of Jewish memory. The brochure mentions nothing of two vastly important Jewish memorials: The Greenhouse and Paneriai Memorial. We visited these two institutions during our first few days in Vilnius, and instantly it was obvious why. 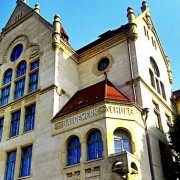 The Greenhouse museum serves as Vilnius’ Holocaust museum. Filled with articles, videos, and first hand accounts, The Greenhouse tells the truth of the fate of Lithuanian Jews, a much needed narrative. Perhaps even more surprising was the absence of the Paneriai Memorial on the brochure. 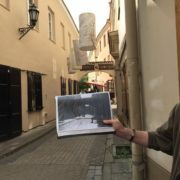 Paneriai, as we now know, is one of the most crucial locations in Holocaust history, and to be neglected is absolutely heart breaking. The mass murder of nearly 72,000 Jews deserves much more than to simply be put on a travel brochure. Furthermore, before coming to Poland I had not heard the name Paneriai, but only vaguely of the happenings that occurred there. So to hear from the memorial director that most of the visitors who attend (and there aren’t many) are foreigners further defended the accusation that these vital Jewish sights are underrepresented. Especially when it comes to Lithuanians. 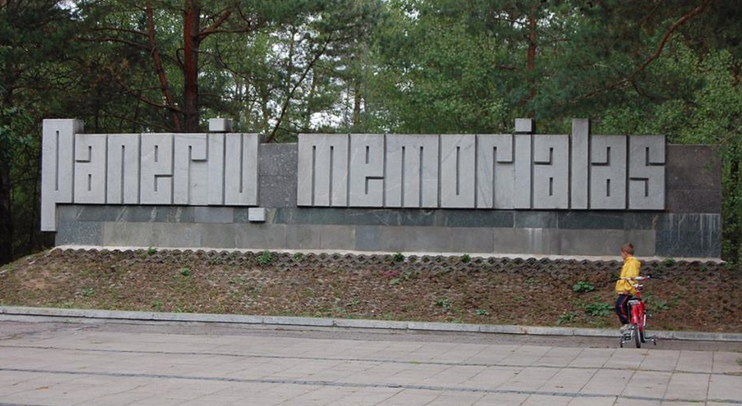 So perhaps a spread on a travel brochure wouldn’t magically increase local Lithuanians’ desires to remember the Holocaust, but it would however, be a start. 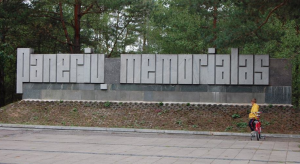 The city of Vilnius and its travel industry is placing a hurdle on Lithuania’s Holocaust remembrance. If people do not visit these sites, the events they resemble will be nothing more than a history lesson from school. Visiting these locations in person makes everything all the more real. You can feel the uneasy air at Paneriai as you stand above vast pits that once held mountains of bodies. 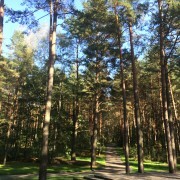 You can read articles describing Lithuanian’s first handedly taking part in the extermination of Jews at the Greenhouse museum. It’s these feelings and more that draw the line between abstract and the real. 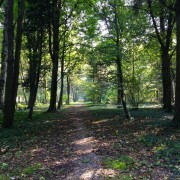 It’s these places that will bring tourists and Lithuanian’s alike to remember the devastation that happened not so long ago in a place not so far from home.